Get started now What is Backup Bird? Setup and installations take ten minutes. Install our simple agent on your servers and enjoy the easiest back up of your life. Receive alarms if something is wrong or get one single status mail for all your servers. 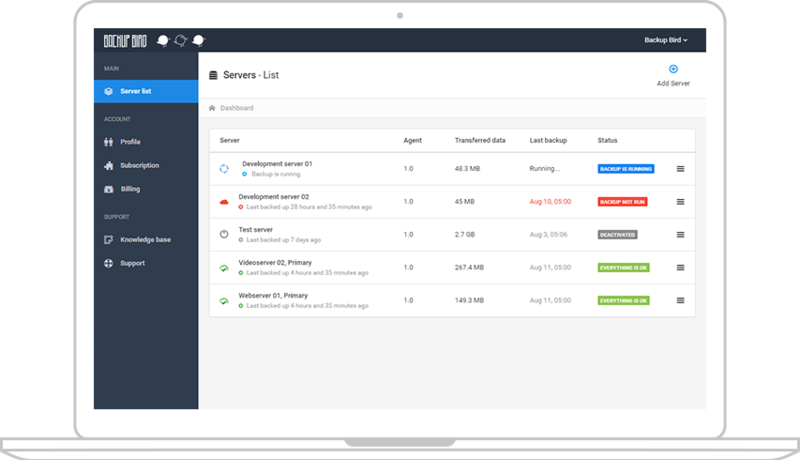 Set up your servers with ease, and watch them in the dashboard. Lean back and let us back up your data and keep you updated in the process! Backup Bird is a great solution to back up your servers. It is a cloud backup service to small business. We can back up both Windows Servers and Linux Servers, and give you a great overview of the process. If something goes wrong during a backup, Backup Bird sends you an instant notification. Backup Bird is made by developers for developers. We focus on data protection and offering you the best backup strategy. We started Backup Bird as we needed a better way to back up our own servers. See the team and read the full story We could not find any server backup software that gave us a complete overview of all servers crosswise operation systems and data. We looked through dozens of server backup solutions without finding the perfect one. Backup Bird back up databases as easy as files and you can quick restore your databases or servers. Just install the backup software on your server, select witch data to backup and where to. Now you can monitor the whole process in the dashboard - And get warnings by mail if an error occurs. Backup Bird is not just another piece of server backup software. We give you high class support, and can even help you setup your server and back up if you ask. Backup Bird is made by the danish software company West Soft Development.